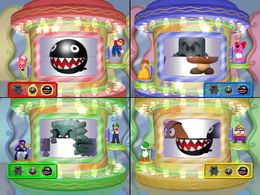 Spin Off is an 8-player minigame in Mario Party 7. A spin-off is where another character from a TV show, book, or game stars in his/her own. The two characters are controlling a rotating cylinder with halves of pictures of Mario franchise enemies. Each person on a team controls one half of the rotating pictures. The teams have to form three different pictures to achieve victory. Rules – "Stop the slots to make the character shown. You must make 3 different characters to win." Advice – "Once the slot stops, press the button to start it anew. The slot will make 1 full rotation before stopping." Spanish ¡Qué cara! What a face! This page was last edited on April 13, 2019, at 18:28.